Near-infrared spectra of the BNS merger event GW170817, and its best-fit model. 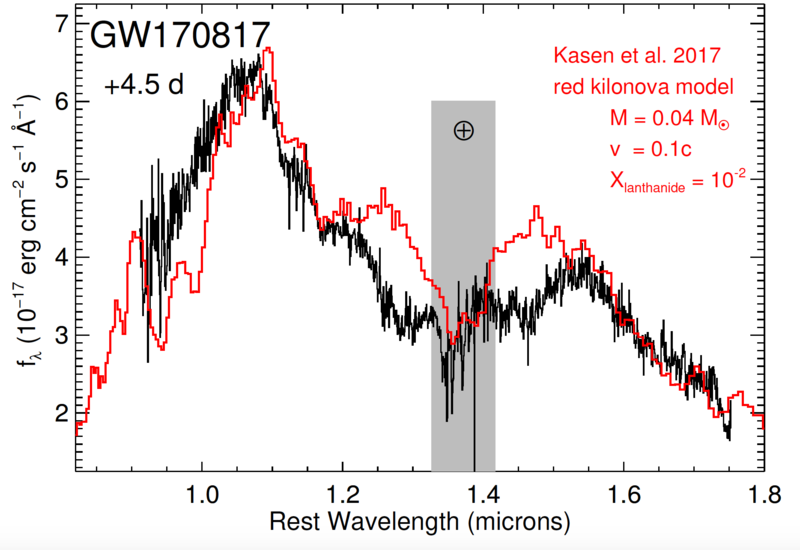 We use a series of near-infrared spectra from the 8-m Gemini South Telescope to search for signatures of r-process nucleosynthesis from the merger GW170817. Our spectra show an initial blue component that peaks in the optical, indicative of relatively low-mass r-process elements expanding with high velocity. However, the later spectra are dominated by an infrared component and show two distinct peaks at 1.1 and 1.5 um. The spectra show a close match to synthetic kilonova models with an ejecta mass of about 4 percent of the Sun’s mass and a velocity of a tenth the speed of light. To match the two peaks, the composition of the ejecta must be about 1 percent lanthanides, which is a much higher fraction than seen in the faster material that dominates the early blue spectrum. The match to “red” kilonova models and the implied lanthanide-rich composition indicate that neutron star mergers are a major site of r-process nucleosynthesis.